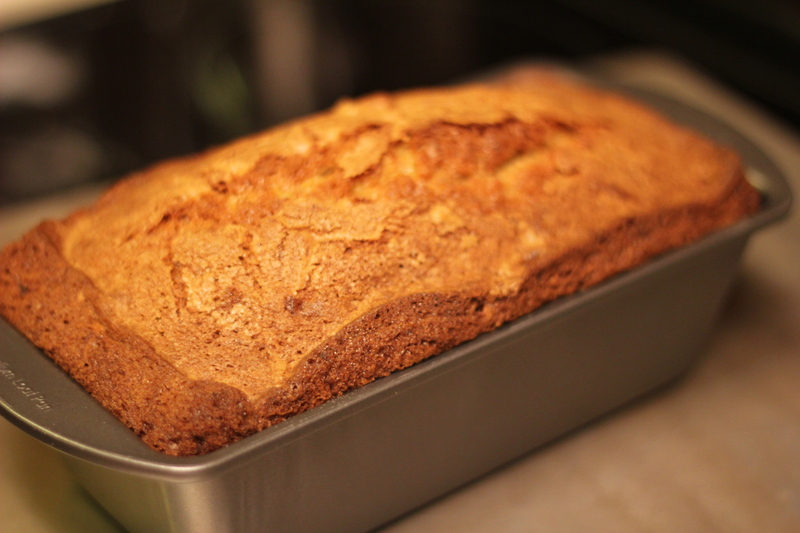 This week, I had an excess of slightly over ripe bananas and the desire to do some baking. What to do? That same day, Ally from A Girl and Her Fork blogged about a recipe for banana bread that she had tried and loved. Simple ingredients, straightforward instructions. Bingo! I was sold. I made it the very next day. The banana bread was legendary. Super moist, lots of depth of flavor, crispy on the edges, just delicious! If you’re in search for a go-to easy banana bread recipe, here’s the one! 1. Preheat oven to 350° F. Coat a 9x5x3-inch loaf pan with nonstick spray. 2. Whisk flour, baking soda, and salt in a medium bowl. Whisk eggs, sugar, bananas, and oil in a large bowl until smooth. Add dry ingredients to banana mixture and stir just until combined. Scrape batter into prepared pan and smooth top. 3. Bake until a knife inserted into the center of bread comes out clean, 60-70 minutes. Transfer to a wire rack; let bread cool in pan for 15 minutes. Run a knife around inside of pan to release the bread. Turn out onto rack and let cool completely.